The United States recognizes Nazi Germany’s conquest of Austria. British Ministry of Food announces “Kitchen Front” campaign to save food. Germany recalls all 1, 2, 5, and 10-pfennig coins to reclaim copper & bronze; will use zinc instead. German, Italian and Hungarian forces begin the invasion of Yugoslavia and Greece. The Luftwaffe carries out several devastating bombing raids against Belgrade and all but wipes out the Yugoslav air force on the ground. The Luftwaffe launches an air attack against the Greek port of Piraeus from bases in Bulgaria. During the raid, the British ammunition ship Clan Fraser is hit and explodes in a massive fireball, wrecking the harbour and port facilities. Australian forces capture Benghazi along with six senior Italian Generals. Italian forces make repeated attempts to break through the weak British blocking forces at Beda Fomm, but cannot. Lieutenant General Erwin Rommel is appointed to command the German forces being sent to Africa. Six Beaufort torpedo-bombers attack the German cruiser Gneisenau, anchored in Brest harbour. One, piloted by Fg Off Kenneth Campbell, makes a successful attack before being shot down, inflicting serious damage that took six months to repair. For this, Campbell was awarded a posthumous VC. Axis bombers attack the port of Alexandria in Egypt. The Japanese make landings on Manus Island in the Bismarck Archipelago. The Japanese air raid on Vizagapatam and Cocanada, India tips India into Allied camp. First U.S. troops arrive in Australia. Germany cuts rations of bread, meat, fats. Due to heavy Luftwaffe raids, British begin to withdraw surface ships from Malta to Gibraltar and Alexandria. 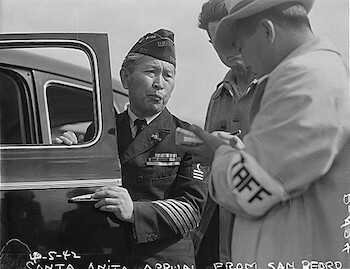 700 Japanese-Americans are assembled at Santa Anita Racetrack. British and American forces in Tunisia launch an attack against the 5th Panzerarmee. Sarajevo falls into the hands of Yugoslav partisans. Preceded by a tremendous artillery and air bombardment, the 3rd Belorussian Front with Four armies, 137,000 men, 530 tanks and 2,400 aircraft begin their final assault against KÃ¶nigsberg, which is held by 35,000 Germans troops. The Battle for Vienna begins. Japanese launch air counterattack (‘Floating Chrysanthemum I’.) on the U.S. Fleet off Okinawa: 800 planes, including 355 kamikazes, strike US naval and ground forces; 400 shot down.